Ken Hopper was a clever half-forward flanker who was born in South Melbourne and grew up in Melbourne’s northern suburbs. 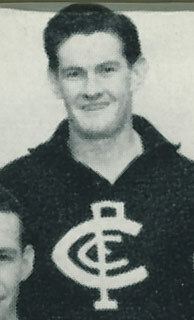 Having developed his football ability at Pascoe Vale, he seemed destined for a good career at Carlton when he played 14 matches in succession after his debut in 1945. From then on however, he found it increasingly difficult to hold his place in a rapidly improving Carlton combination. In 1947 he crossed to Hawthorn, and gave the Hawks excellent service for five years. When World War II began in 1939, Ken was too young to enlist, and so had to wait until 1943 before he could join the RAAF. All up, he spent three years in uniform as a radio technician, and was still serving when he played his debut game for the Blues in round one of our legendary 1945 season. Ken wore guernsey number 2 for the first time that afternoon at Princes Park, lining up on a half-forward flank beside Alex Way and Charlie McInnes - team-mates who were both destined for glory as late inclusions in Carlton’s Grand Final team. It wasn’t an auspicious start for Hopper – the Blues lost to the Demons by 21 points – but at least he held his place in the seniors over succeeding weeks. By July, he had stretched his career to an unbroken sequence of 14 matches – only to be eventually omitted after a narrow 3-point loss to Essendon at Princes Park in late July. After that, Ken wasn’t selected again for five weeks. When he was, he spent most of the afternoon sitting on the bench, watching the Blues maintain their late-season momentum by crushing a hapless Geelong by 94 points at Princes Park in round 19. Left out again the next week, he must have endured contrasting emotions as the Bob Chitty-inspired Carlton juggernaut powered its way to the 1945 flag. Although Hopper did not play in that momentous Grand Final for Carlton, he was part of a celebratory tour to Sydney and Canberra by a party of Carlton players and officials in the following year. Some 63 years later, his snapshot photos of the tour were shared with the Carlton Football Club, and the gallery can be accessed below. Ken played only twice more for the Blues in 1946, and in 1947 transferred to Hawthorn. At Glenferrie Oval, the struggling Hawks gave Hopper considerably more opportunity, and he quickly developed into a true utility who could play anywhere. From 1947 to 1951, he racked up 66 matches for the Hawks, kicked 9 goals, and was among their most popular and respected players throughout his stay. Contributors to this page: PatsFitztrick , Jarusa , Bombasheldon , tmd1 , true_blue24 , molsey , WillowBlue and admin . Page last modified on Thursday 05 of June, 2014 20:23:54 AEST by PatsFitztrick. 1982 Rd 9 Blues Goal Blitz Vs Swans.